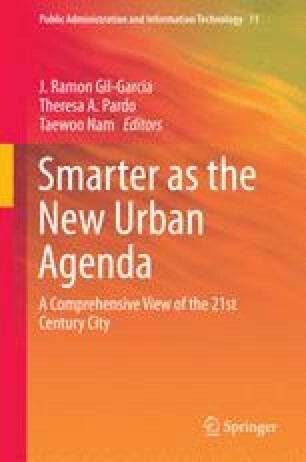 In this chapter, we examine the role of citizen participation in the development of smart cities through literature and example cases from Norwegian cities. We present an overview of technologies used for participation, including their strengths and weaknesses, discuss how different types of projects should be handled differently in the decision-making process and present recommendations for how practitioners can set up citizen participation projects in Smart City initiatives. We present three different categories of participation: citizen competence and experience, data collection through citizens’ use of technology and participation as democratic value. Further, we discuss how these categories can be understood in terms of, who sets the agenda and who makes the final decisions in order to frame the project internally in the municipality and externally so that citizens participating know what the outcome of the project will be. Finally, we offer suggestions for technologies that could be used to collect citizen input in each of the three categories of participation. Charalabidis, Y., & Loukis, E. (2011). Transforming government agencies’ approach to eparticipation through efficient exploitation of social media. Paper presented at the European Conference on Information Systems (ECIS), Helsinki, Finland. http://Aisel.Aisnet.Org/Ecis2011/84. Dameri, R. P., & Cocchia, A. (2013). Smart city and digital city: Twenty years of terminology evolution. Proceedings Itais 2013. http://Www.Cersi.It/Itais2013/Pdf/119.Pdf.Accessed 2 Jan 2014. Norwegian Ministries. (2012). Digitizing public sector services. http://Www.Regjeringen.No/Upload/Fad/Kampanje/Dan/Regjeringensdigitaliseringsprogram/Digit_Prg_Eng.Pdf.Accessed 12 Dec 2013.